Highest quality equipment for your pets safety. At Noble Dog we specialize in providing your dog with an outstanding, stress-free grooming experience. It is of the utmost importance to us that each dog is treated as an individual. Their grooming experience is customized to suit their specific needs as well as your personal tastes. 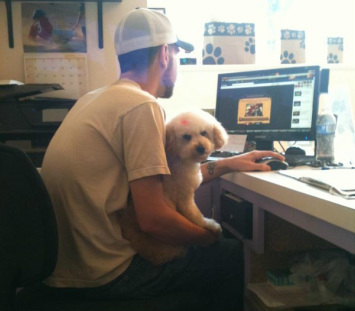 Our groomers are classically trained in all breed trims, as well as custom pet clips. We strive to make sure that every customer has a great experience with us. We are well-known for our gentle touch when it comes to handling dogs. Dogs undergoing the grooming process may see it as a stressful or scary experience, and we take it upon ourselves to reduce the anxiety your pet may feel being in a traditional grooming salon. We have custom built our facility with the safety and comfort of your precious pets in mind. Our state of the art grooming room features a two loop safety system exhibited above. We do not allow "nooses" to be used on your pet. The two loop system is much safer for wiggly pets and can be secured around the shoulders (like a seat-belt) to avoid any unnecessary pulling or choking on your pet's neck. It also eliminates the chance of your baby falling to the floor. It also can be used as a hip rest for older dogs with sore hips and arthritis. This is important because although your dog must be standing for proper grooming, they no longer have to endure the painful process of standing for sometimes hours. In this way we provide a much more comfortable experience for your pooch. No hot metal blades used on your pet! We also have a blade cooling device (Taxi Vac) which is designed to avoid any nasty clipper burns, which are painful and irritating to your pet. This also allows us to spend more time on your pet's haircut without ever taking our eyes off of them to change our blades when they become overheated. A relaxing experience for your dog. Our bathing room features a stainless-steal tub with a walk-in ramp. This is excellent for keeping your pet in the most sterile conditions possible. The ramp is also an excellent alternative to your dog needing to be lifted, and is wonderful for dogs who have hip or back problems or are just afraid of getting put into a tub. It allows them to walk-in themselves and be secured inside. Each dog is given a hydro-message as part of their bath, which gives them a pleasant and relaxing experience. Our professional and courteous bathers take pride in the safety and relaxation of your pet. Only the finest products for a Noble Dog. Every product we use on your dog is environmentally friendly and made especially for dogs. We have a variety of treatments and shampoos for all skin-types and coat types. Your dog's skin and coat is evaluated and a selection is made based on their individual needs. If you prefer, we allow you to bring your own shampoo, and welcome requests. Cages too cramped? Open environments too dangerous? We have a solution with doggie suites! If you don't like the idea of your baby being kept in a cage or the thought of your dog being at risk of contracting fleas or being attacked by another dog in an open environment, then our individual doggie suites are the perfect solution! While your dog is waiting to begin their groom or to be picked up to go home they are housed in our custom-built suites. They will enjoy the benefits of a more open environment, which includes a comfortable pet bed to relax on after their trip to the spa. We built the suites to have an open feel so that your dog doesn't feel that they are confined. Our gates are built with custom "puppy pickets" to ensure that they are able to peer out and not feel trapped, but, are close enough together so that other dogs walking by cannot disturb them. We have had clients notice the difference in their dog's demeanor when they arrive to pick them up, that they are happy and feeling more confident and less shy. Make your dog a VIP with our friendly staff. We never rush a dog through the grooming process, so, please allow the necessary time for a proper spa experience. Most breeds can be completed within three hours or less, although, the time varies depending upon the size, degree of difficulty, coat condition, and temperament. We do our best to have your dog in and out in a reasonable amount of time. A time estimate can be given when they are dropped off for their appointment, but, there are no guaranteed out times. This is for the safety of your pet.